Osei Kofi Tutu, the fourth ruler of the Ashanti Empire, serving from 1701 until 1717, was also one of the most important leaders of the state that is now part of modern-day Ghana. During his childhood, Tutu was part of the royal court of Denkyira and Akwamu. Having learned about politics from Akwamu, and with their military and political support, Tutu took the throne of the Ashanti Empire in 1701. Under Tutu’s leadership the Ashanti conquered Denkyira’s dependencies and other neighboring states, making it the most powerful state in the region. Okomfo Anokye, Tutu’s principal lieutenant, assisted Tutu in establishing a capital at Kumasi and giving the Empire a constitution, a standing army, and a long era of political stability. Tutu also established the Golden Stool (which is said to contain the soul of the Ashanti People) as the symbol of the Empire. Before Tutu became ruler, the Akan-speaking people were already moving toward creating a centralized state. Nearly all the chiefs of the Amantoo (the region of Akan-speaking peoples) belonged to the same clan, so the idea of a union of peoples was already instilled. Tutu took advantage of this sense of union and convinced the various chiefs that the Golden Stool was the soul, power, and energy of the Ashanti people. With the stool he controlled, Tutu was able to infuse a sense of nationality within the Empire and thus more easily incorporated the various Akan-speaking groups. 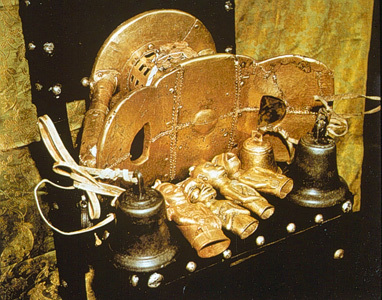 The Golden Stool remains the symbol of Ashanti unity today. Osei Tutu was determined to make his growing Empire a permanent political state. Besides centralizing power in the new capital, Kumasi, he used the constitution to craft a new political hierarchy with the Asantehene as the supreme political and spiritual leader of the Empire. The various chiefs ruled their local areas under power derived from the Asantehene. Each year a festival was held in Kumasi attended by all of the chiefs who swore their loyalty to the Asantehene. Territorial expansion under Osei Tutu was rapid for the Ashanti Empire. The highly organized Ashanti Army included cavalry, infantry, scouts, royal bodyguards and other units with the Asantehene as the supreme military commander. This military organization was far more advanced than most of Ashanti’s neighbors. Osei Tutu died in 1717 while waging war against a neighboring people, the Akyem. The Empire he created, however, would continue until finally defeated by the British in 1900 and incorporated into the Gold Coast Colony. Kevin Shillington, Encyclopedia of African History (New York: Fitzroy Dearborn, 2005); John Iliffe, Africa: the History of a Continent (New York : Cambridge University Press, 1995); S.N. Eisenstadt, The Early State in African Perspective: Culture, Power, and Division of Labor (New York : E.J. Brill, 1988). Culture, Power, and Division of Labor (New York : E.J. Brill, 1988).